On February 28th 2006, at the Photo Marketing Trade Show (PMA 2006), held in Orlando we met Kazuto Yamaki, Chief Operating Officer, from Sigma Japan. We took some time to set up a Q&A session at the booth from Sigma, and asked Kazuto Yamaki about Sigma's APO f/2.8 70-200mm lens, and the expected future developments of Digital SLR Lenses. Question: Please introduce yourself. What is your task at the company and please tell us something about your career. Answer: My name is Kazuto Yamaki and I am the Chief Operating Officer. I am mainly located in Japan at the head office of Sigma. I am involved in product development and business development. Among my task is working with other companies. I have been working for Sigma since 1993. I started as mechanical engineer and have had a variety of professions within the Sigma company. Among others financial department, cost accounts and of course business development. I truly can say that I know the company in every aspect. It is not only because of all the diverse professions I have had within the company. 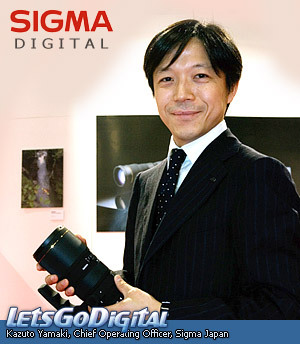 Sigma was founded by my father so I know most of the employees since my childhood. One of my wishes is to make Sigma the company that it deserves to be, in every aspect. Times are changing within the industry and I am very keen of being award of this changes. Question: Will Sigma continue designing lenses for the 35mm frame, now only Canon has full frame and the analog photography is decreasing so fast? Answer: Off course we keep manufacturing and designing lenses for the 35mm format cameras. As long as there is a demand, we will design and manufacturer lenses for it. As for the digital market, we are dealing with experienced and new users. The experienced users are those who can effort for example the Canon EOS 5D DSLR camera. They have to buy new 35mm format lenses and we believe that there is also a potential group of consumers who are being tempted to buy a full format DSLR camera as soon as they can afford it. By buying the 35mm format lenses they are more or less preparing themselves for full frame cameras. Question: With the new Sigma APO f/2.8 70-200mm lens, the focus seems to shift to Digital Lenses. Though, you didn't change the actual focus length of this lens - which is very popular with analog photography. Why don't you change the focal length so it would be comparable with a 70-200mm as with the analog version? Answer: I cannot comment on future models and specifications. Off course we are planning to develop other lenses. 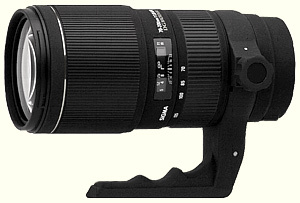 As to the Sigma APO 70-200mm f/2.8 lens, even in the digital SLR camera market this lens is of high interest with the consumer. It seems that the digital user prefers and appreciates this lens and its characteristics. This is one of the reasons why we introduced it, there is high demand for it. Some of the users like to use this lens for their full frame sensor digital cameras others plan to use it in the near future and in the meantime have the benefit of the multiplier factor. Question: Compact digital cameras are having an increase in optical zoom range. Mostly the telephoto. Why aren't there more wide-angle lenses? Only a few models have a 24mm. Answer: This has a technical reason. For wide angle the lenses need to be bigger and the cameras are getting smaller. It is very difficult to design a wide angle in compact digital cameras. A very popular focal range is 28-80mm. But to get 4mm more wide angle is very difficult to make. A wide angle makes the lens significant larger which makes it difficult to fit into a compact digital camera. Compared to the 35mm format compact cameras we thought that we were dealing with compact size cameras. Just take a look at the digital compact cameras now and see how small these cameras have become. We are tempting to design such a lens, but at this moment it is a matter of compromise. As long as the size of the camera is of that importance, this kind of wide angle lens stays difficult to implement. Question: Sigma also introduced a lot of lenses for the FourThirds system. Again with the same focal length as some of the digital lenses (30mm 1.4 was also introduced for the DG range). Differs the design of the lenses for FourThirds a lot from that of the DG range? How do you scale the FourThirds system, you seem to have adopted the system totally? Answer: In a technical point of view developing a lens for the FourThirds system is more or less the same. It is only a matter of changing the image circle. The FourThirds system is a very good system. It uses a different size of sensor which has a lot of potential. The FourThirds system results into a very compact size lens which is a real advantage, especially for the large aperture tele lenses. For example, if we compare the difference in size of the Sigma 300mm f/2.8 and the FourThirds Sigma 150mm f/2.8 it is a huge difference in size. Although the bokeh may differ, the Sigma 150mm f/2.8 will give you a perfect high quality end result. Question: Will the zoom range for D-SLR lenses also increase? And what kind of techniques are necessary to make those lenses out of excellent quality? Answer: It is more a matter of demand,. Off course we will increase the zoom range if there is a demand for this. A lot of consumers want high quality lenses for different reasons, some of them just need a zoom lens, and others prefer prime lenses because of their high speed f/1.4 or f/2.0 etcetera. So there will be a variety of lenses for digital SLR lenses, it is not only the zoom range that is of the greatest interest. A lens with a large zoom range is just one trend we see, but at the same time we also see an increase in high speed lenses. Question: If you could change the digital imaging industry. Would it be more convenient to have one or to have different sizes for sensors? And is it a marketing or a technical point of view? Answer: From my personal point of view, I believe it would be better to have a variety of sensor formats. You may compare this with the analog film, medium format produced the best quality, much better than 35mm film could deliver. This created diverse segments, a different way of photography. So therefore we are satisfied with the diverse segmentation and the variety of image sensors. Question: Sigma doesn't have many lenses with an image stabilization. Why is that, may we expect more lenses with optical stabilization of Sigma? Answer: This is of our great interest. At this moment we are studying to incorporate image stabilization in our lenses. We develop the image stabilization system ourselves. I cannot comment on future products, but it is of our interest. Question: Talking about the special needs for digital photography. What are the main issues you have to deal with when designing a lens for digital photography? Answer: The digital cameras have changed, the resolution is increased significant. We have to deal with more pixels which means that we have to deliver a better lens that can handle the resolution. Our design process has improved over the last couple of years and you may say that every element of this process changed during the years. The new lenses are far more dedicated to digital than before. For the digital SLR camera lens it is easier to implement telecentric design due to the larger back focus distance. Question: A basic fact is that the lens is one of the most important quality points of photography. How important is lens quality comparing to the image sensor? What is the weakest link? Answer: With digital photography the lens is becoming more and more important. To get the most advantage of digital imaging you need the best optics. With the traditional film photography the user only blew up their best shot. Nowadays the digital user is enlarging the image via their monitor and very easy gets a closer look to all the details in the image. The end user is getting more and more into the quality of the optics. This requires improvement all the time. There is not really one weakest chain in the whole digital imaging link; it is more a combination of all factors that result into a bad or good result. If the optics is good or even excellent, but the resolution is low or algorithms are inferior, the end result is not the most ideal. Then again, if you take a high resolution, high quality algorithms and poor optics, you won't get a good result either. You have to find the right balance between all the components. Within the compact digital camera group, because they have fixed lenses which characteristics are known, problems like chromatic aberration and distortion can be eliminated by the processor using intelligent software. For digital SLR users it becomes more difficult because the camera manufacturer don´t know which lens of which brand is used with the body. Finding the right balance, for the manufacturer in the developing process, but also for the consumer is the answer when you are in search for the best end result. Question: Most of the camera manufacturers are using a smaller sensor. Only Canon has a full frame sensor. What are the advantages and disadvantages of the smaller sensors for the lens design? Answer: We can make the image circle smaller for the APC sized sensors. It makes the lens smaller and easier to handle. But the back focus distance needs to be relative large. This fact makes it more difficult to design the lens. It's a physical issue where we have to deal with.